Tuesday, September 11, 2018. Remembering the consonance and the dissonance in human nature. Tower of Voices, Flight 93 National Memorial Site, Pennsylvania. 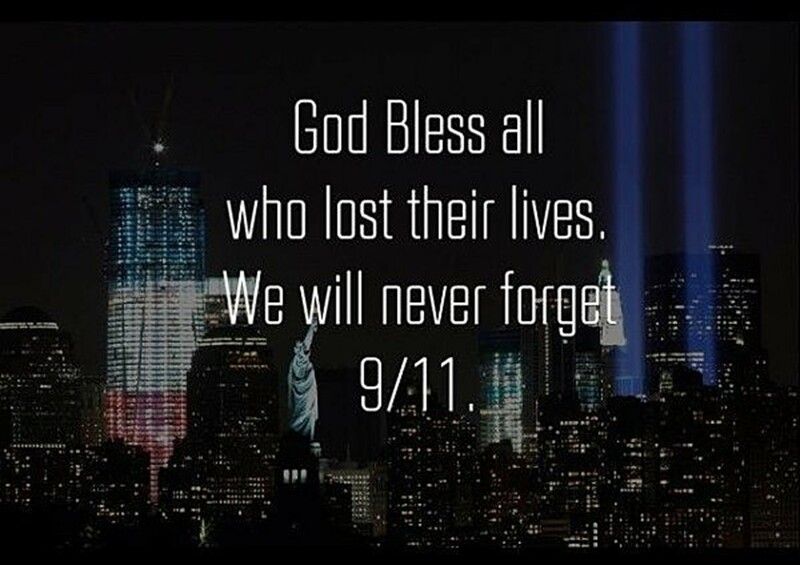 On Tuesday, September 11, 2018, the 17th Anniversary of 911 attacks on the United States, I reflect upon the consonance and dissonance in human nature. The serenity and nobility of the site in Pennsylvania depict the dimension of consonance and the crash of Flight 93 depicts the dimension of dissonance when the world and man are viewed as the works of God. I define the United States using its national motto which proclaims, “In God We Trust.” For we trust in God, it is rational to claim that man is constituted as a Spiritual Being in God’s own image. I have a great problem in accounting for man’s evil thoughts and actions that cause pain and suffering. The wickedness of man got exposed on Tuesday, September 11, 2001. For God’s creation is perfect, there can never be two opposing or self-contradicting dimensions of human nature. Man’s spiritual nature reveals the consonance, the resonance of God’s nature in His work. How does the dissonance intrude into the world? How can the man be estranged, separated, or alienated from his own true or original nature? Tuesday, September 11, 2018. Remembering the consonance and the dissonance in human nature. Reflections at Flight 93 National Memorial Site, Pennsylvania. In my analysis, the prophecy of Isaiah has come true. Man is cursed to suffer. 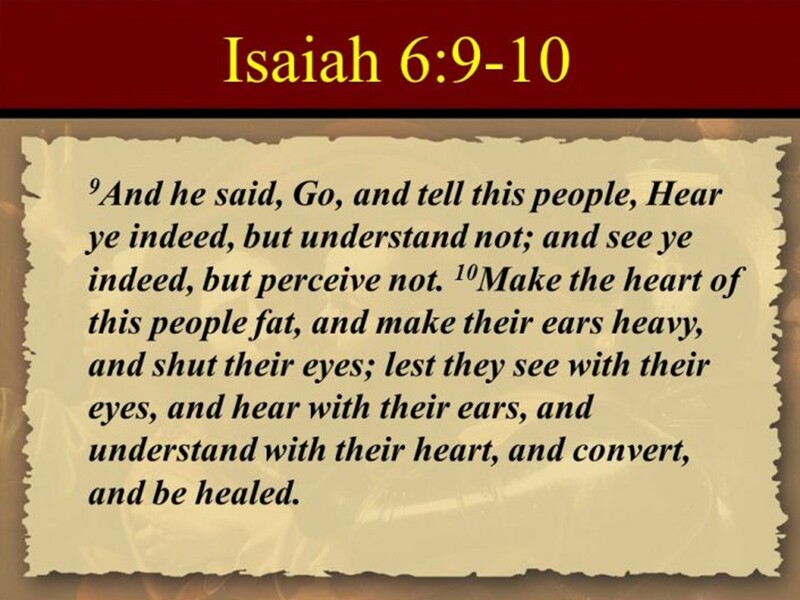 There can be no healing without conversion by the Spirit. Tuesday, September 11, 2018. Remembering the consonance and the dissonance in human nature. Reflections at Flight 93 National Memorial Site. Tuesday, September 11, 2018. Remembering the consonance and the dissonance in human nature. Reflections at Flight 93 National Memorial Site in Pennsylvania. The Tower of Voices is conceived as a monumental, ninety-three feet tall musical instrument holding forty wind chimes, representing the forty passengers and crew members. The intent is to create a set of forty tones (voices) that can connote through consonance the serenity and nobility of the site while also through dissonance recalling the event that consecrated the site. Artwork courtesy of bioLinia and Paul Murdoch Architects. The wind chimes inside the Tower of Voices. The chimes will be constructed of polished aluminium tubes ranging 8-16 inches in diameter and approximately five to ten feet in length. The size of each chime is dependent on the musical note and associated frequency that it is intended to produce. The Tower of Voices serves as both a visual and audible reminder of the heroism of the forty passengers and crew of United Flight 93. On September 09, 2018 Flight 93 National Memorial will host a dedication event to complete the final phase of construction and complete the permanent memorial. 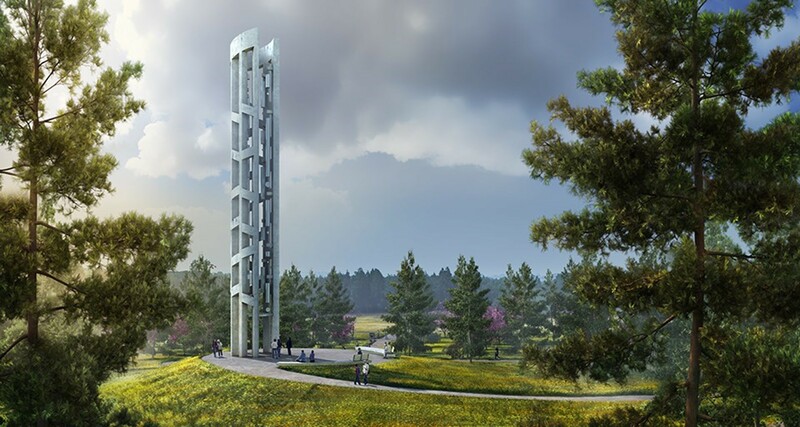 The tower is conceived as a monumental, ninety-three feet tall musical instrument holding forty wind chimes, representing the forty passengers and crew members. It is intended to be a landmark feature near the memorial entrance, visible from US Route 30/Lincoln Highway. 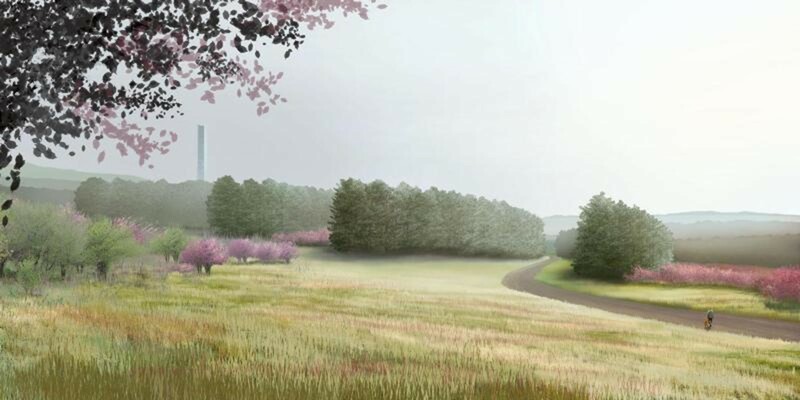 The Tower of Voices will provide a living memorial in sound to remember the forty through their ongoing voices. The tower project will be constructed from 2017 to 2018 with a dedication of the project on September 9, 2018. Funding for the design and construction of the project is provided through private donations to the National Park Foundation and the Friends of Flight 93 National Memorial. There are no other chime structures like this in the world. The shape and orientation of the tower are designed to optimize airflow through the tower walls to reach the interior chime chamber. The chime system is designed using music theory to identify a mathematically developed range of frequencies needed to produce a distinct musical note associated with each chime. The applied music theory allows the sound produced by individual chimes to be musically compatible with the sound produced by the other chimes in the tower. The intent is to create a set of forty tones (voices) that can connote through consonance the serenity and nobility of the site while also through dissonance recalling the event that consecrated the site. The tower is approximately ninety-three feet tall from the base to the top with some height variations. The Tower cross-section is a “C” shape with a fifteen foot outside diameter and eleven foot inside diameter. The “C” shape allows sound to reflect outwardly from the open side in a fan-shaped pattern. The chimes will be suspended a minimum of twenty feet above the main plaza and will be suspended from the interior walls of the tower up to the top. The tower walls will be constructed of precast concrete segments linked by connectors. 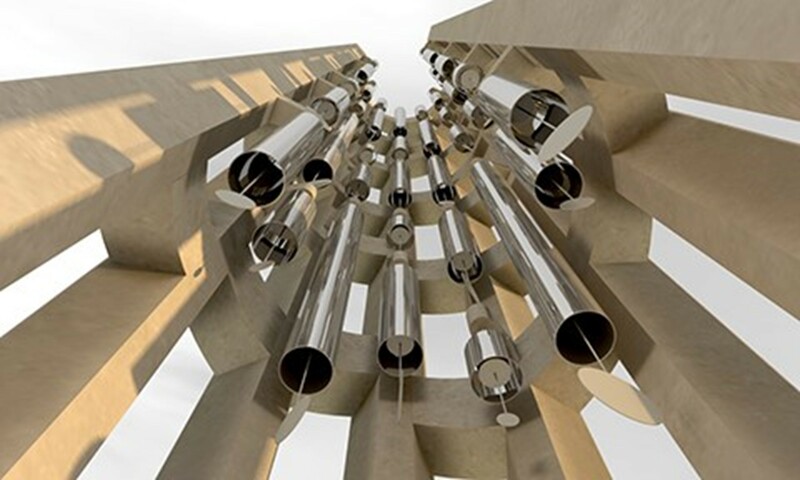 The chimes will be constructed of polished aluminium tubes ranging eight to sixteen inches in diameter and approximately five to ten feet in length. The size of each chime is dependent on the musical note and associated frequency that it is intended to produce. Chimes of this size and magnitude do not currently exist in the world. The chimes are wind activated and will have internal strikers attached to sails projecting from the bottom of each chime. The tower is located on an oval concrete plaza that is built on top of an earth mound to create an area more prominent on the landscape. The plaza includes two curved concrete benches facing the opening of the tower. The tower is surrounded by concentric rings of white pines and deciduous plantings. The concentric plantings may be interpreted as resonating “sound waves” from the Tower, alluding to the auditory qualities of the chimes housed within. A direct paved path leads to the tower from the parking lot. A longer, meandering crushed stone path winds through the trees and allows visitors an alternative approach to the tower. All other landscaped areas of the project will be planted with a native wildflower seed mix similar to other landscaped areas of the park. 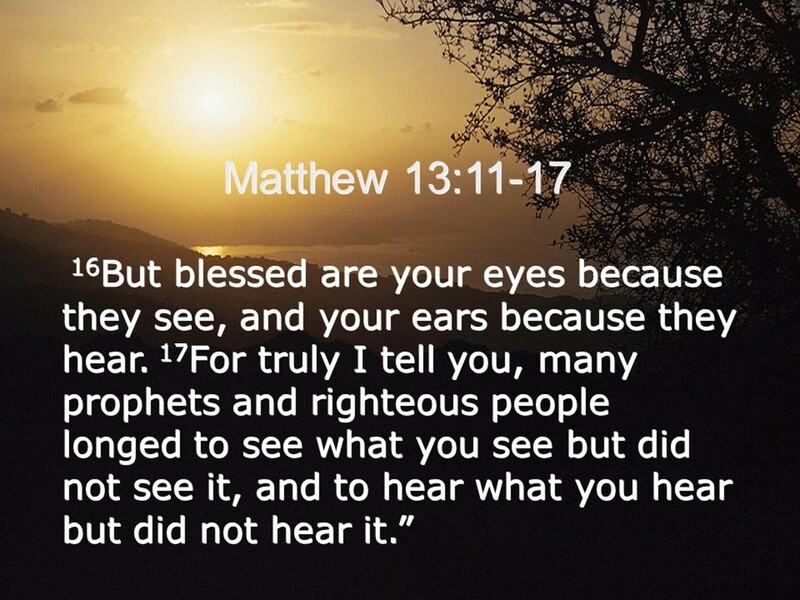 Posted byWholeDude September 11, 2018 Posted inBlessings for Peace, In God We TrustTags: What is Man?